HARARE, Zimbabwe (CNN) -- Zimbabwe's education system is beginning to battle back from years of neglect and an exodus of teachers. From a distance the Mathabisana school looks to be in an OK condition. But many parents still find it impossible to pay the U.S. $24 a year fees and some resort to using chickens as payment. The country's education minister in the year-old power-sharing administration believes it could be decade before standards are back up to Zimbabwe's good past record. When President Robert Mugabe took office in 1980, he prioritized education. His government managed to lift Zimbabwe's adult literacy rate to one of the highest on the continent. But like everything else Mugabe achieved during his first decade in power, he has in the past few years managed to undo. The government stopped funding some schools as far back as 1999, and as the economy crumbled so too did the quality of learning. According to the education department, 20,000 teachers have left the country in the past two years and half of Zimbabwe's children have not progressed beyond primary school. When CNN visited a Mathabisana primary school in Umguza, in the southwest of Zimbabwe, headmaster Nonkululeko Ndlovu said that at one point teachers used charcoal as a substitute for chalk. "There are no textbooks to talk about at the moment because I remember the last text books were bought sometime in 2000 or so, when we were still getting government grants but now we don't have anything. "Those text books have reached their shelf life. An aid organization donated 32 text books which we really appreciated and we are using those text books right across the grades, trying to impart knowledge to the kids." In a school with 406 children, that means that almost 13 children have to share one text book. "So what we normally do is write problems on the board and the children read, this is what we are doing in a bid to ensure that children learn," Ndlovu adds. The families of some children are so poor they cannot afford the reduced fees of U.S. $2 a year -- only a quarter of the children have the funds. Some parents have even resorted to paying fees in chickens and other life stock. Ndlovu said: "When the parents bring a chicken to sell or to offer as school levy, teachers sometimes buy it, so if they agree on the price, the teacher would get the item, pay the fees, and then if there is any change, he would give the parent the change." Education Minister David Coltart says he inherited a catastrophic system when he took over in February. "Seven thousand government schools were closed and most of the 80,000 teachers were on strike. At the head office building there was no water in our 18-storey building and the toilets were in a mess. That was emblematic of the state of schools," he told CNN. CNN asked the headmaster at Mathabisana about the children's concentration level and trying to learn under such difficult circumstances. "We have children who are excelling even though they are sitting on the floor, so that is why we are hoping if things normalize these children may be the best in the world," he said proudly. Ndlovu is one of the teachers who did not join the exodus. "In any normal situation when others go out, definitely others have to remain. There is no way we can all of us just go out. "Those who are remaining, we are just hoping that things will be better. It is not because things are better for us but we just feel we need to teach these kids ... to become something in the world." Zimbabwe's unity government has managed to get some striking teachers back into classrooms by offering them an improved wage of $150 a month, but that is hardly a living wage. "If you can pay your rent, pay your bills here and there and then you are able to come back to school. We just do that," Ndlovu says. "We cannot all go out and leave Zimbabwe empty without teachers. Those who are outside understand that we are playing a significant role because some of them left their kids behind. They definitely know they are being taken care of, we are teaching them." 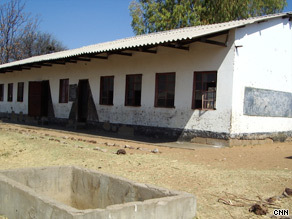 The education minister said he was allocated one-tenth of the budget he needs to rebuild Zimbabwe's education system. He is hoping donors will come to his country's aid. According to his estimates, it could take up to 10 years to get Zimbabwe's education system to where it was in the early 90's. And he understands that he will only be able to achieve this if he can retain committed civil servants like Ndlovu.